Last month on the podcast, Martin and I discussed some of the various training methods we use to target leg strength. As this month’s HMMR Media site theme is “beyond the barbell” it made sense for us to dig a little deeper into the methods we use outside the weight room and what options are available to coaches in this regard. Leg circuits are used for beginners, but can be adapted for athletes of all levels. 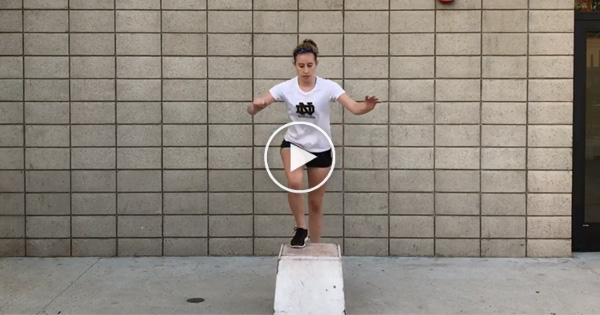 To adapt circuits, play around with the four key variables: reps, sets, rest, and loading. Aim for speed and continuity to keep the muscles under tension. Develop movement parallel with strength by challenging coordination and hitting all planes of movement. One example is the lunge. It is a simple exercise that athletes execute all the time. With some small changes it can add some variation and be even more effective. At Notre Dame we have adopted some of Vern’s lunge and reach series. Below is part of the series where athletes lunge and reach down. By leaning forward slightly, athletes stress and strengthen the hamstring more. They also increase mobility. The lunge is also executed in four directions and hits every plane of movement. One exercise with a little variation can become very versatile. » Learn more: our theme in April is beyond the barbell. We’ve put together a plethora of new content on the topic, including Vern’s thoughts, video of mini band exercises, get the most out of them, when to move beyond the barbell, and the thoughts of expert Steve Myrland. The video is just part of one series. In the whole video we share five circuits and series. Check it out to learn more. And if you are not a plus member, join now so that you can access all 13 videos in our library covering a wide range of topics and demonstrating the whole spectrum of athletic development exercises.